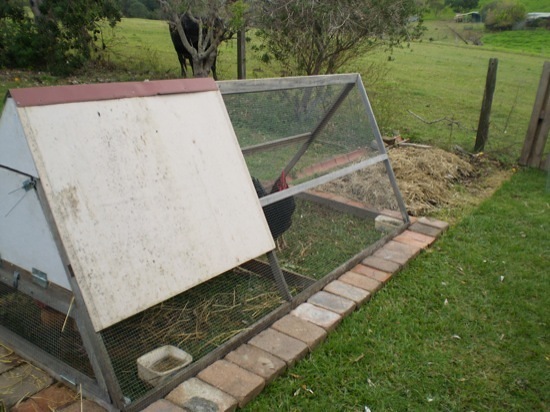 The chicken tractor I built with my father a couple of years ago is still going strong. 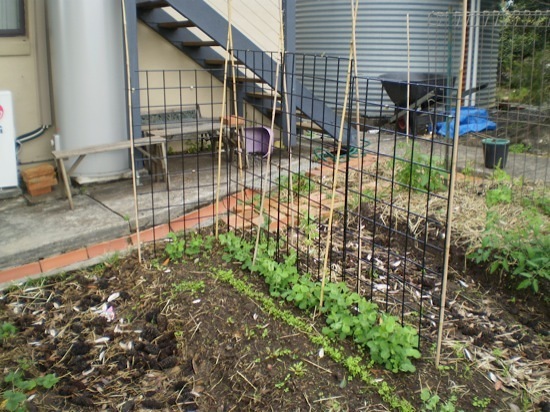 Since moving to Jamberoo we’ve been using it to build garden beds – we place it where we want the bed, leave it there for a few weeks until the grass has been cleared, then move it along and top the new garden bed with compost. This photo is just after moving the tractor – you can see the new garden bed in the background, and the fresh grass for the chickens inside the tractor. We put heavy pavers and/or sleepers around the pen to stop foxes from digging under (there’s no wire bottom on the cage, because we want the chickens to be able to scratch properly). It does take a little time for the chickens to do their thing, so if you want lots of garden beds fast this isn’t the best way. However, we find that making new garden beds slowly works well for us – we only have one new bed to deal with at a time, so it’s manageable. We don’t get overwhelmed with a large new area to sow. The only problem with this system is that the chicken tractor is heavy and difficult to move. We needed some kind of handles to make lifting it easier. Not long ago Megan pulled out a wine rack that was left in one of our cupboards by the previous owners. The wire grid became a pea trellis, and we had a bunch of brackets left over. They looked kind of like, well, handles. 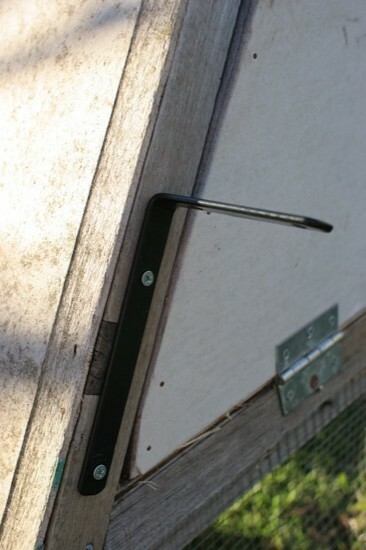 A couple of minutes’ work to screw the brackets on has made great handles! It’s now a doddle to move the chicken tractor. If you’re building your own tractor or cage, make sure to give some thought to how you’d like to lift it. Designing handles into the frame makes life a lot easier. It looks like you’ve got your method down to a science! Do you give the girls a lot of treats when the grass is getting very patchy? I always felt like my hens got a bit run down when I used this method unless I gave them lots of extra greenery. @Anna: Hi! I was just reading your blog when this comment came through! Yep, we toss a lot of weeds and vegetable trimmings into the chicken ark – one of the great benefits of having it right beside where you’re gardening. They seem to be staying very healthy and laying well, even through winter. Our winter is a lot milder than yours, though :-). 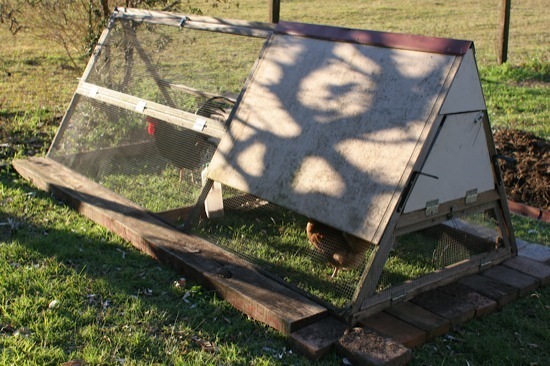 It seems this way of using chicken tractor is good for you. I think I should use this method too.